The rapid rise of Pinterest has made the visually driven platform a popular social media marketing tool for brands and industries of all kinds. Now, healthcare brands are seeking ways to use Pinterest to fulfill the needs of patients at every stage of their healthcare journeys. After all, patients are searching for relevant healthcare information on the Internet and in the doctor’s office. In addition, this quest for the knowledge extends from before diagnosis to throughout treatment and even after completion of care. 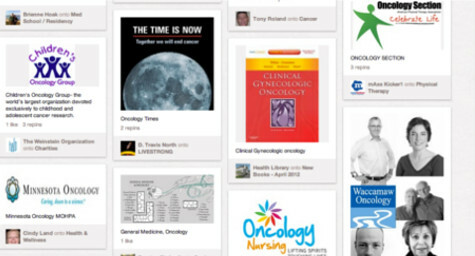 As a result, their insatiable desire to find answers and advice is leading healthcare brands to consider Pinterest as a worthwhile way to improve patient education and provide them with the information they want to solve the problems they face. MediaPost.com recently reported on why Pinterest is useful in social media marketing for reaching healthcare consumers looking for solutions and support. More than anything, Pinterest is a content curation tool that generates a virtual visual library of information. This makes it an ideal source of education, inspiration, and motivation that can be easily consumed and shared. Brands realize the power of Pinterest to serve as a blank canvas that they can fill with content relevant to the consumer’s interests and issues. As a result, a growing number of healthcare brands are filling their Pinterest “pinboards” with images that consumers can relate to at every phase of treatment. Health information can often be complex and confusing. The use of visuals on Pinterest breaks through barriers of literacy, intelligence, and culture to provide information that everyone can understand with a single glance. In addition, research from 3M indicated that people process visuals 60,000 times quicker than text, while other studies showed that the human brain takes longer to interpret language than images. On an emotional note, patients can feel alone and distraught as they go through a health crisis. Pinterest provides a place for them to express their feelings through pictures on their personal pinboards, while also allowing them to find camaraderie and comfort by viewing the pinboards of others who can relate to their struggles. Pinterest can serve a number of purposes for healthcare brands by enabling them to literally show consumers the information and understanding they’re desperately seeking. With Pinterest, healthcare brands can place possible solutions to a patient’s problems right before their eyes. To learn more about the latest healthcare marketing trends and how Pinterest can be used to engage with patients, contact MDG Advertising. At MDG Advertising, a full-service South Florida advertising firm with offices in Boca Raton and New York, NY, our 360° marketing approach uses just the right mix of traditional and online media to reach your healthcare marketing goals. While some industries may fare better in print and others online, we strive to create a balanced approach where digital, traditional, and social media marketing efforts support each other and your marketing message is tailored to the medium. To stay on top of the latest healthcare marketing trends, contact MDG Advertising.